I have broad research interests in wildlife ecology, conservation biology, behavioural ecology, and invasive species. My recent research has focused on understanding the impacts of invasive cane toads on wildlife in northern Australia, and developing novel solutions to reduce toad impacts. My research has involved a combination of laboratory experiments and longer-term field projects, in collaboration with Dr Tim Jessop (Deakin University), Dr Tim Dempster (Melbourne University), Dr Mike Letnic (University of NSW), and Professor Rick Shine (University of Sydney). I am currently investigating how native species adapt to invaders, which is crucial for understanding both the short and longer term effects of invasive species on native communities. I'm also interested in chemical communication, dispersal, and mating systems in snakes, and the evolution and maintenance of anti-predator behaviour in lizards. This latter research has involved collaborations with Professor Martin Whiting (Macquarie University) and Professor Scott Keogh (Australian National University). I am passionate about conserving wildlife, and much of my research aims to develop solutions to current conservation problems. For example, my graduate students and I have developed novel methods for restoring degraded rock outcrops in the Sydney region. If you want to get a feel for the type of research that my group does, please visit my Publications page. Northern quolls are iconic marsupial predators that were once common across northern Australia. Sadly, populations on the mainland crashed following the invasion of the toxic cane toads. We can’t stop the toads, but we may be able to train wild quolls to avoid consuming cane toads before the toads invade. How can we do this? Well, after a lot of thought, I came up with a deceptively simple idea – just make the quolls sick! In 2009, Honours student Stephanie O’Donnell tested my idea and successfully trained captive reared quolls not to eat cane toads by feeding them a small non-lethal toad paired with a nausea-inducing chemical. The quolls become mildly ill, and subsequently refuse to attack live cane toads. Importantly, these toad-smart quolls survived following reintroduction to the wild. Training wild quolls not to eat cane toads will be more challenging. My students and I are working with Dr James Smith, from the Australian Wildlife Conservancy at Mornington Wildlife Sanctuary, Western Australia, to see if we can train wild quolls to avoid consuming cane toads. We’ve discovered that wild quolls will consume the baits, which is a good start. Our next step is to deploy toad-aversion baits (toad sausages containing a nausea-inducing chemical) ahead of the toad invasion front. If wild quolls that consume toad sausages become ill, then they may subsequently refuse to attack live cane toads. If we can train enough wild quolls to avoid eating cane toads, then we may be able to prevent the local extinction of this iconic predator. But even if wild quolls survive, how will their offspring learn not to eat cane toads? Well, in 2010 my colleagues from Kakadu National Park and the Territory Wildlife Park reintroduced captive reared ‘toad smart’ quolls to Kakadu National Park. My PhD student ﻿Teigan Cremona﻿ monitored the population through time, and radio-tracked young quolls and their mothers. Teigan discovered that each generation learns to avoid toads. Like humans, juvenile quolls spend extended periods foraging with their mothers, even after they have left home. We know that 'toad smart' females sniff and reject toads, so perhaps young quolls learn not to eat cane toads by watching their mothers. Alternatively, young quolls may learn not to eat toads by ingesting small non-lethal toads that induce nausea and conditioned taste aversion. However, it remains possible that genes for toad-aversion, or rapid learning, or are also involved. To figure out which of these mechanisms – genes, social learning, or taste aversion – are involved, I’ll be working with Dr Ben Phillips from the University of Melbourne. Ben and I were fortunate enough to awarded an Australian Research Council Linkage grant to tackle these questions, and hopefully, we’ll be able to prevent future extinctions of the northern quoll. We have some fantastic support from our industry partners, Kakadu National Park, The Territory Wildlife Park, The NT Department of Land and Resource Management and The Australian Wildlife Conservancy. We currently have three PhD students working on this project, and we are optimistic that we can develop solutions for preventing the extinction of one of Australia’s most iconic carnivores. As a kid, I was fascinated by reptiles, particularly snakes, and I'm fortunate enough that I can continue to follow my passion and study these amazing animals. Broad-headed snakes are arguably one of Australia's most beautiful snakes, and unfortunately, humans are largely responsible for their demise. 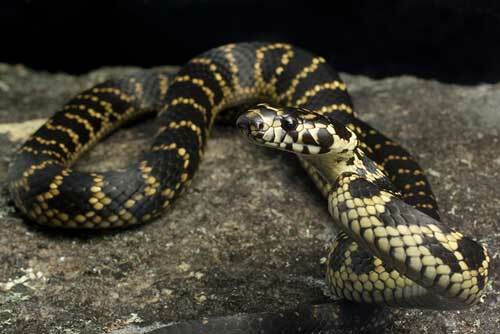 Broad-headed snakes need sandstone rocks for shelter sites, and these rocks are prized by gardeners and landscapers. Rocks are essentially non-renewable - they can take hundreds (or thousands) of years to weather from the parent rock, and if the rocks are removed, the animals that once sheltered underneath them have no where to call home. My PhD student Ben Croak found that after rocks are removed, many animals probably fall prey to birds. Since the 1800's, humans have removed bush rocks from sandstone rock outcrops, and broad-headed snakes have disappeared from many areas where they were once abundant, and the species is confined to a handful of national parks. Unfortunately, the key threats to broad-headed snakes are bush rock removal and the illegal poaching of snakes for the underground pet trade. What can you do to help this snake? Don't buy bush rocks from landscape suppliers or nurseries. Lobby your local council to bring in by-laws to prevent the sale of bush rocks in nurseries. Use alternative products, like quarried sandstone, or sleepers from sustainable forests. If you see someone with a trailer or truck full of bush rocks in a state forest or national park, phone NSW National Parks and Wildlife (1300 072 757) . If you want to read about some of the research my team does, then please visit my News and Publications page.